Alexander Ovechkin and the Washington Capitals finally won the Cup. The Washington Capitals overcame a one-goal, third-period deficit to capture their first Stanley Cup in franchise history with a 4-3 win over the Vegas Golden Knights. 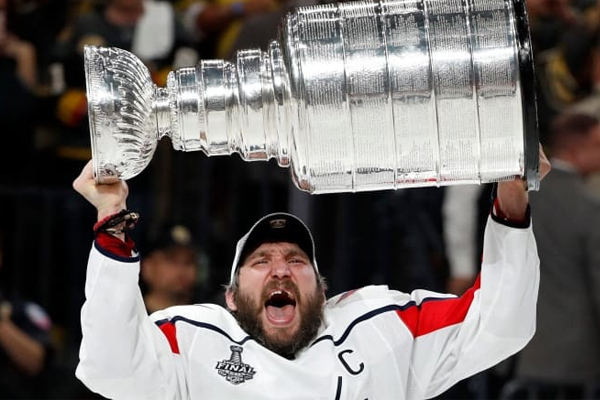 Alex Ovechkin, in a moment of pure joy and extasy, put both hands to his head and screamed while he left the bench and once again when he finally hoisted the Stanley Cup. The Capitals become the first team since the 1991 Pittsburgh Penguins to win the Stanley Cup after trailing in all four series. As for the Golden Knights, the NHL’s newest franchise team, their Cinderella story has come to a close. The Knights had the greatest debut season in modern pro sports history. Few expected the division title they delivered, and fewer still thought Vegas could challenge for a championship. After striving through 13 of his franchise’s 43 seasons, Ovi and the Capitals are now sitting on top of hockey for the very first time. Alex Ovechkin was handed the Conn Smythe Trophy and his very first Stanley Cup, which was well deserved, even if it meant the Golden Knights had to lose it.